Polycrystalline ferroelectric Bi4Ti3O12 ceramics have been prepared by the method of reactive liquid phase sintering. The sintering behaviour of the Bi2O3-TiO2 composite was examined by plotting the isothermal densification curves. The results indicate that the starting oxides are involved in the reaction even at temperatures lower than or equal to 800°C, but the reaction advances at a very slow rate. Above solidus, the liquid phase promotes an extended reaction. Saturation observed in two densification curves, at 875 and 1100°C demonstrate that the reaction proceeds by two steps. A completion of the Bi4Ti3O12 formation occurs after 60 min of sintering at 1100°C. Optical micrographs of sintered bismuth titanate ceramics show randomly oriented ferroelectric grains separated by a paraelectric intergranular layer. The Bi4Ti3O12 crystallites exhibit a platelike morphology, similar in the appearance to mica, as evidenced by scanning electron micrographs. 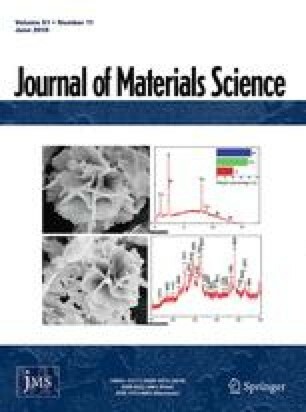 Isothermal annealing (750 to 950°C) does not affect the microstructure and electric properties of sintered bismuth titanate. The considerable value of dielectric permittivity and the appearance of hysteresis have been correlated to the presence of oxygen vacancies within the pseudotetragonal structure of Bi4Ti3O12. The oxygen vacancies are preferentially sited in the vicinity of bismuth ions as evidenced by X-ray photoemission data. XPS and AES measurements confirm that the surface concentration of cations comprising the Bi4Ti3O12 ceramics does not deviate from the nominal bulk composition.